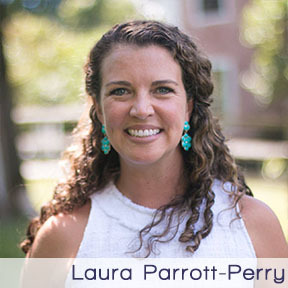 Laura Parrott-Perry is the single mother of two amazing children. She studied Rehabilitation Counseling at Springfield College and has extensive experience in Special Ed classrooms both as an art teacher and para-educator. She is the author of the popular blogs, In Others’ Words, and The Golden Repair on DivorcedMoms.com. Her work has been featured on Huffington Post and in Boston Magazine. Laura is the Co-Founder of Say It, Survivor, an organization that provides workshops for survivors of childhood sexual abuse to help them process and tell their stories on their terms as part of the healing process. She is a frequent public speaker on the subject of childhood trauma, and is deeply committed to her role as an advocate and educator. She is also a survivor of sexual abuse. And she’s talking about it. Shamelessly. Not one of us gets to escape suffering, so what do we do with the stories of heartache, betrayal, trauma and abuse that shape us? We are story-making creatures. When we have experiences that we struggle to understand, we fill in the murky parts. We make sense of our stories of heartache and trauma the way ancient civilizations made sense of the weather and natural disasters- with story. We may lack the whole picture, but it becomes true for us. The story we believe informs our identity, the way we move through the world, the people we bring into our lives, the power we give them, and the way we understand understand God and God’s story. Courageously and compassionately stepping into stories of pain and harm helps us re-narrate our stories, bringing deeper truth, healing, hope and connection with ourselves, each other and God.